XICO VIEJO/ARCATA – That old sewing machine in your attic might be a tool for prosperity and independence for a woman in a mountainous Mexican rain forest village. The 15 women, who are now learning to sew, lack the basic tools they need to practice their newfound craft. 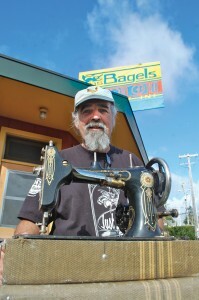 That’s why Los Bagels is collecting sewing machines which are in working order for transport to the remote village. The hope is that that the machines will allow the women to produce and market garments, affording them some income and independence. Xico Viejo is a village of 500 inhabitants located in a green mountain valley southwest ofJalapa, the capitol of the state of Veracruz, Mexico. Daluvia Mendoza, a single mother of two boys, has offered to teach a free course in sewing. By the end of the third two-hour lesson, the women had learned how to take their measurements, transfer them to make a paper pattern, cut out the pieces and completed a skirt. The women love the class and so does Daluvia. The course is being subsidized by Ahora L.L.C. a company that dedicates all its profits from making and selling folk art The company is managed by Paul Hebb, a partner in Los Bagels, Inc.
Hebb has lived in Mexico for 20 years and works (without pay) on community developement projects in rural mountain villages in the states of Oaxaca and Veracruz. Ahora is acquiring used sewing machines which the women can buy at cost making interest-free payments they can afford. Any donations of sewing machines, fabrics and or cash are greatly appreciated. Xico Viejo does have U.S.-compatible electricity. Any donated machines should be in good working condition. To make a donation, contact Dennis Rael at Los Bagels at (707) 822-3483. Paul Hebb will be in town Nov. 27 and 28 to pick up any donated sewing machines and drive them down to Xico Viejo. To find out more about what Ahora makes and does, visit ahorafolkart.com. This entry was posted on Wednesday, November 24th, 2010 at 1:15 pm	and is filed under News, Community. You can follow any responses to this entry through the RSS 2.0 feed.